Interesting to note Barclays the # 3 global FX powerhouse, has partnered with FXCM for their new UK retail FX platform, Barclays Margin FX – but why? 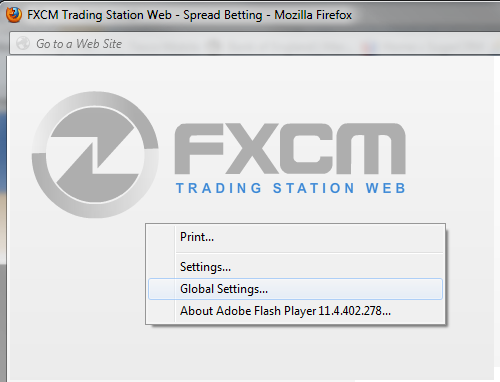 Barclays will naturally provide the FX liquidity, with FXCM providing the front end technology, and UX design. 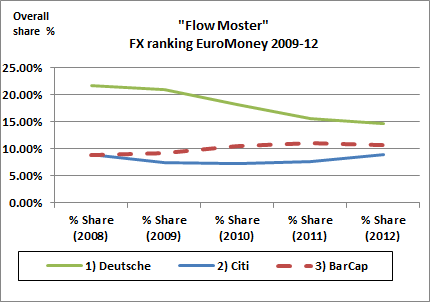 The chart below shows that Barclays are still at #3 in the Global FX ranking based on EuroMoney data. 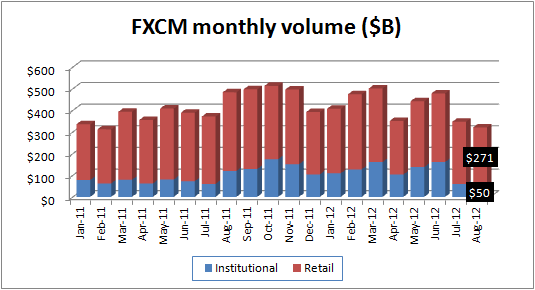 Whilst below the chart from LeapRate shows how FXCM institutional FX flows are all but disappearing, as they focus on retail FX (although retail vols are don over the summer)- hence the rationale for this partnership, as FXCM are leaders in retail FX. But, the interesting part, is why would Barclays, with their deep knowledge of FX didn’t build this in-house. In a EuroMoneyFXNews Interview, Paul Inkster, head of product at Barclays Stockbrokers, says the main question people ask is why Barclays did not keep the whole project in-house. “We like to work internally with our partners and leverage off their strengths, but we are quite agnostic as to who provides a particular service to us,” he tells EuromoneyFXNews. 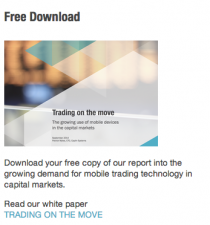 He says while Barclays Investment Bank brings strong consistent pricing, FXCM brings the know-how to engage with retail customers. Sounds like a winning combination, superb FX liquidity, married with deep client understanding and great UX design.